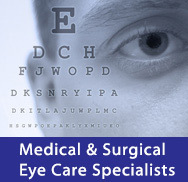 We offer a variety of ophthalmic diagnostic testing at Ophthalmic Consultants of Rockland including digital fundus photography, optical coherence tomography and the latest in optical biometry. A comprehensive ophthalmologic examination will usually include an assessment of your visual acuity, a slit-lamp evaluation, intraocular pressure measurement, and an examination of the back of the eye (retina). This evaluation may require the installation of eye drops to dilate the pupils. Pupillary dilation will blur your vision, especially for near, and also cause excessive glare. We are happy to provide you with solar shield disposable sunglasses after your visit, however, if you have had sensitivity to pupil dilation in the past, you may wish to arrange for help in transportation home. A word about ‘refraction’: Testing for a new glasses or contact lens prescription is not covered by many medical insurance plans. There may be an additional charge if you require this service.